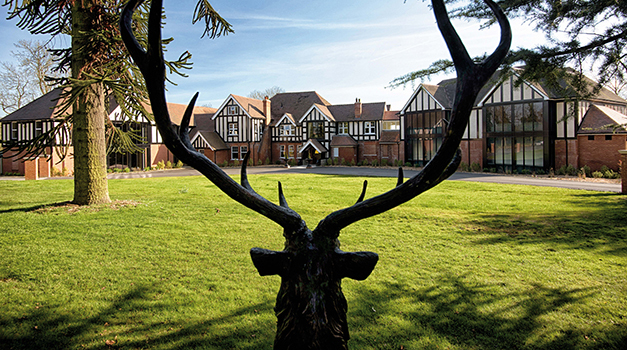 Those who live in Kent are lucky to have the newly opened Reynolds Retreat in Sevenoaks on their doorstep. Even for non-locals, this Spa Spy thinks it is well worth the trip. Along a winding path, the retreat sits proudly behind a large, perfectly manicured lawn. The building is a converted manor house and has a commanding presence over its 17 acres of beautiful Kentish countryside. It’s easy to see why this part of the world is known as The Garden of England. On arrival, we rang the doorbell and the receptionist let us into the building. The reception area is light and airy and the decor brings the outside in with soft greens, browns, creams. The building has a great balance of classic and contemporary, with some striking art throughout from local artists. 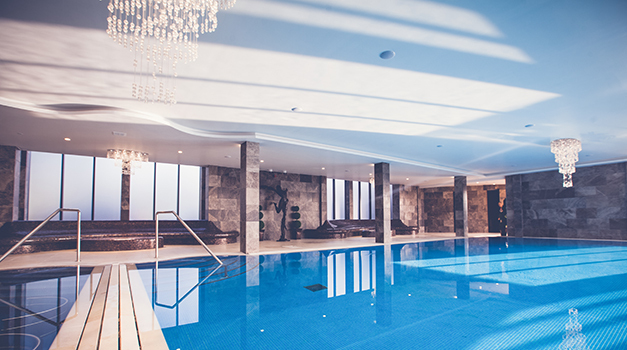 The spa is set over three floors, with the gym, class studios, pool and thermal area on the ground floor, the café, relaxation room and changing rooms on the middle and treatment rooms at the top. The journey is considerate and keeps the passive (spa) and active (health club) areas as separate as possible. The retreat was buzzing with members and spa days, which created a wonderful friendly atmosphere. We have been to spas before and been made to feel unwelcome by the regular members: not the case here at all. After our guided tour we got changed and went for our treatments. I usually have my treatment after relaxing in the spa for a while, but am so glad I had it first this time. It enabled me to relax on a deeper level for the remainder of the day. I had the Decleor back massage and foot treatment. It was just over an hour in total but felt so much longer. The treatment room was white with lilac coloured lighting which felt uplifting. The back massage focused on my shoulders and lower back, which I really needed. Like many people, I drive far too much and hold tension in these areas. Turning over, my feet were exfoliated, a cool nourishing mask was applied and a massage to finish. I felt like I was walking on air when I left the treatment room: my feet were tingling and my shoulders no longer felt parallel with my ears. My therapist walked me to the relaxation room where I sat enjoying the cucumber infused water while waiting for my spa partner. She shortly joined me and was equally blissed out after having a back and scalp massage. She had been suffering from a cold and found the treatment decongesting and delivered with a soothing touch. Just what you need when you have been ill.
Next we headed for lunch. The café is contemporary with dark wood tables, comfortable leather seats, white china on the tables and glass chandeliers hanging from the ceiling. The menu is impressive. Healthy and indulgent food was available with lots of hot and cold options. My spa partner chose a booster soup of broccoli and spinach to start and Harissa chicken burger for the main course. I enjoyed quinoa with broccoli and cashews to start and salt baked sweet potato with goats cheese and chick peas for the main. Both were beautifully presented and very tasty: the chef here clearly understands healthy cuisine. We were offered Prosecco - which if not driving home afterwards we would have happily accepted - but had herbal teas instead. A mother and daughter sat near us with an impressive afternoon tea. 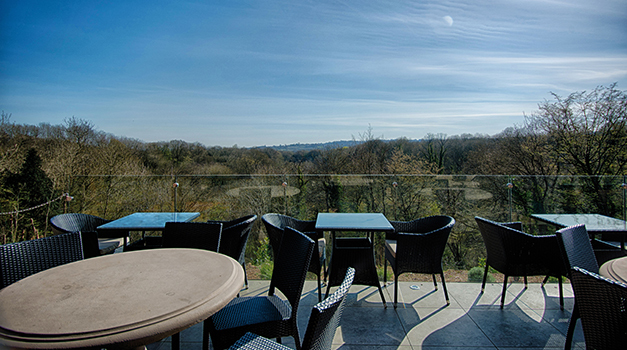 The views from the café are stunning; we felt we were sat at the top of the county with the trees and valleys sweeping beneath us. If you visit the spa for a treatment, allow an hour to have lunch or afternoon tea afterwards. It’s worth extending your visit for the food and views. Our afternoon was spent enjoying the pool and thermal experiences. The pool looks out over the same stunning views as the café, and with floor to ceiling windows and light flowing through, you feel like you are swimming amongst the trees. The 16 metre pool was slightly cool, great for swimming lengths and working off our lunch. The hydrotherapy pool sits just beside it, and is much warmer – we happily stayed in here chatting and enjoying the many jets. Mosaic tiled seating covers the length of one side of the pool so you can sit, dry off and admire the view. The thermal area is to the far side of the pool and has foot spas, sauna, steam room, monsoon showers, and an ice fountain. With a great amount of facilities and enough space to comfortably enjoy them all, Reynolds Retreat would be a wonderful place to become a member or visit for a regular spa treat. The staff are friendly, the atmosphere is vibrant, and the location is just stunning. Taking time out for your self is vitally important. We need to look after our mental and physical selves and invest in our own wellness. After just four hours in this spa, I floated out feeling like a new person.